The other day I was at my doctor’s office and her assistant noticed I had a book in my hand. “Oh, what are you reading?” she asked making conversation. I told her it was a biography about Thelma Todd. She gave me a blank stare that easily said, who? 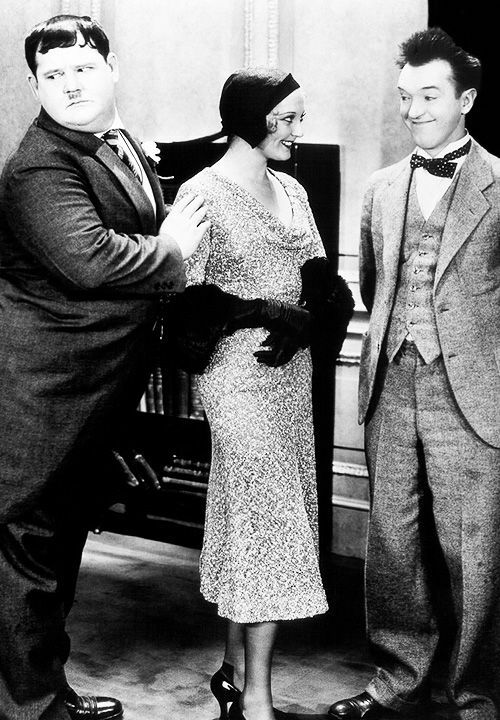 I explained that Todd was an actress back in the 1920’s and 1930’s who worked with the Marx Brothers and Laurel & Hardy. My answer seemed to satisfy her and we went back to my examination business. This seems to sum up what most people remember, if at all, about Thelma Todd. 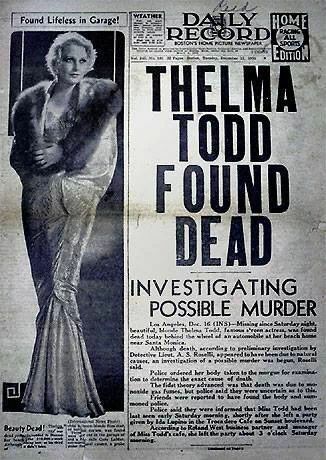 That and the fact her death, more than eighty years ago, remains one of Hollywood’s most interesting unsolved cases. Todd was found dead from carbon monoxide poisoning in her car in a garage near where she was living. While her cause of death was always certain, what has remained a mystery is how did she end up there and why? Was her death accidental or intentional sucicide? Or maybe…it was murder. In her new biography, The Ice Cream Blonde: The Whirlwind Life and Mysterious Death of Thelma Todd, author Michelle Morgan details a thoroughly fascinating look at the actress’ career, her life and untimely death. Todd was more than a supporting actress in a few well known films. During her career she acted in more than one hundred films. Along with the Marx Brothers and Stan and Olliie, Thelma worked with other great comedians such as Charley Chase, Harry Langdon and Wheeler and Woolsey. Working for the Hal Roach studios, Todd was eventually teamed up with Zasu Pitts, and later with Patsy Kelly for a series of comedy shorts. Todd also appeared in many dramatic films (she wanted to be taken as a serious actress) including Mary Stevens M.D. and the 1931 version of The Maltese Falcon where she played Ivy Archer. Ms. Morgan provides a well rounded look at what Thelma was as a person and not just a victim or a movie star. We get to know her as a person. She was bright, witty, did charity work, partied, had a strong-willed personality and sometimes had bad taste in men. The last two of which might have helped guide her toward her tragic end. As expected, the latter part of the book focuses on Todd’s untimely and mysterious death. Ms. Morgan lays out three possibilities with detailed research for each, however, she draws no conclusions or makes any claims toward solving the murder. She just lays out the various scenerios supported by her in depth investigation.The Ice Cream Blonde: The Whirlwind Life and Mysterious Death of Thelma Todd is both a Hollywood biography and a mystery. Fans of both will find it a fascinating read. Michelle. Morgan previous works include books on Marilyn Monroe and Madonna. My thanks to the Chicago Review Press or providing a review copy of the book and the opportunity for the interview. John: Thank you for taking the time to do this interview. 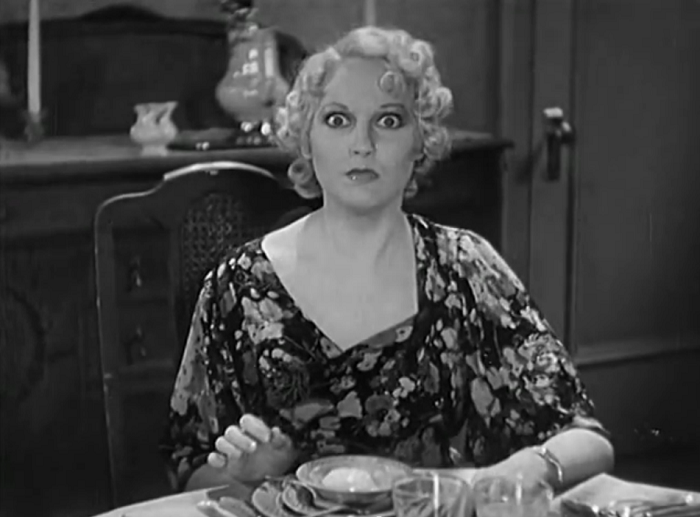 What attracted you to write about Thelma Todd? Michelle: You’re very welcome! Thanks for asking me. I first discovered Thelma while I was writing a book about Marilyn Monroe. I discovered a letter from director Elia Kazan, which mentioned Pat De Cicco. I had no idea who he was, so researched and discovered that he’d been married to Thelma Todd. I knew her name but nothing else about her, so tried to find out more. I was shocked that she had died so mysteriously at only 29 years old, and I was intrigued by her story. I didn’t plan to write about her at that point, but I just could not stop thinking about her. I decided to write her story because I felt that her life was most certainly over-shadowed by her death, and I thought she deserved more. Initially I will admit that I was quite interested in writing about her death because of the mystery surrounding it. However, after finding out more and more about her, she became so real to me and I knew I had to write about her life; to tell her story and promote her talent. 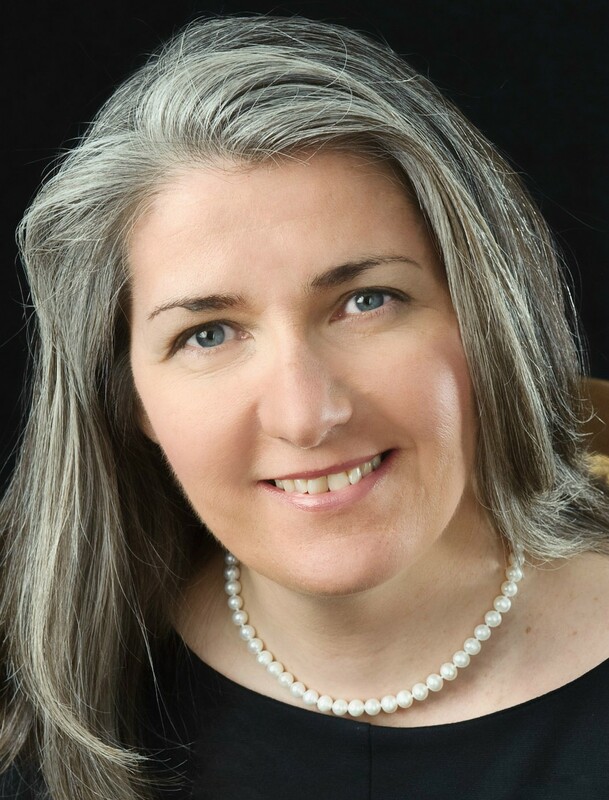 My publisher actively encouraged a thorough biography of her entire life, so I was more than thrilled about that. John: Where does the title “The Ice-Cream Blonde” come from? Michelle: One of Thelma’s nicknames over the past 80+ years was ‘The Ice Cream Blonde’ (which seems to stem from the color of her hair), so my publisher thought that would make a great title. I initially called it ‘271 Steps’, after the amount of stairs she apparently went up on the night of her death. However, when the book became more and more about Thelma’s life, it was apparent that the title should change. 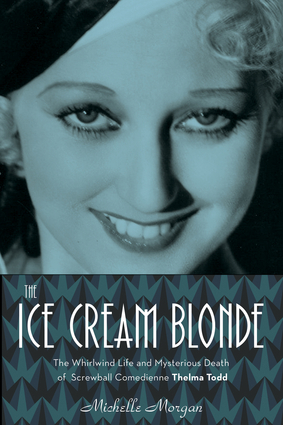 I gave my publisher a list of nicknames, film titles etc., and they thought ‘The Ice Cream Blonde’ was the best one. I agreed! 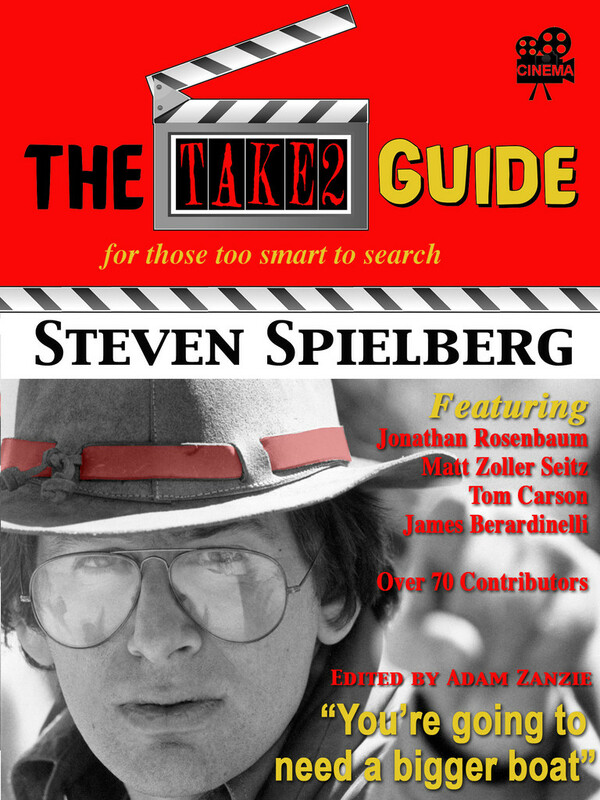 John: One of the many things I liked about the book is that I came away from it liking Thelma Todd a lot as a person. She comes across as smart, strong-willed, caring and down to earth. Someone you would really like to know though she did have a party side to her. Michelle: Yes that it something I really enjoyed about writing the book. As I said, when I started off I only knew her name, but as I got further into my research, she really became a fully-formed human being, and I grew to love her very much. I collected many original photos and 1930s magazines when I was writing the book, and even though I have now finished my work, I will never want to part with them and I will always be looking out for more to add to my collection. She was all of the things you mention above and I get the impression that she could be a really good friend as well as a great laugh. If I had a time machine, I’d love to go back to the 1920s and whoop-it-up at the Ambassador Hotel with her! I would have loved to know her! John: Her early days in New England were both idyllic and sad. She was a student/teacher, Miss Massachusetts, but there was also some tragedy in her life. Would you tell us about that? Michelle: Yes there was tragedy for sure. One of my friends recently described her as being born under a bad sign and that is appropriate because there was always some kind of sadness following her around. When she was just a little girl, her brother died in a terrible accident and Thelma later told an interviewer that she was there when it happened. This totally changed her whole life and her family was never the same again. Then just literally as she was beginning her career, her father died very suddenly and again everything changed. From then on she looked after her mother, and the two moved to Hollywood together and lived with each other for many years. Her mother’s life was extremely tragic too when you think about it, because she lost her entire family – husband, son and daughter – and as a mother you never think about that happening to you. It must have been catastrophic for her. John: Can you tell us about how she got her start in the movies? Michelle: Lots of people think that Thelma got her start through entering beauty contests, but she used to get very angry about that. She was indeed a beauty queen, but that had little bearing (if any) on how she got into the movie business. Instead, she was a student teacher, and after a series of events, ended up going to an interview at the Famous Players-Lasky studio. They liked what they saw and put her into a new project of theirs – the Paramount Pictures School. She and various other youngsters learned all about films, acting, make-up, costumes etc. and then made a film called ‘Fascinating Youth’, as their end-of-term project. The film took them around the States and the youngsters won movie contracts for their graduation prize. Many of them weren’t renewed, but Thelma’s was, and she made a few more movies before being sent out Hollywood. That was basically what happened to set her on the road to stardom. John: Once in Hollywood, you write that she found the industry both enthralling and shocking. How so? Michelle: Yes, Thelma thought that by going to Hollywood, it would give her the opportunity to change her image completely. She was known to be quite prim and proper while on the east coast, so going to the west enabled her to start again. She cut her hair, she changed her clothes, and totally reinvented herself, though the person she was underneath never really altered. She was always the down-to-earth woman she had been before stardom. She was in awe of Hollywood and its stars, but at the same time felt that it didn’t have any kind of sincerity, so she became quite suspicious from early on. She was threatened with blacklisting because she wouldn’t ‘entertain’ producers at a party, and then went on to tell several reporters about the experience. That took a lot of guts and integrity. She was nobody’s fool and did not want to be treated as such. John: Meeting Hal Roach was an important point in Thelma’s career. Would you tell us a little about how they met? Michelle: Thelma had actually just been asked to go to England and star in a few films for a British studio, but a friend of hers said she should lay-off doing drama and stick to comedy instead. Of course Hal Roach was a major force in the comedic industry, so it was recommended she should meet with him instead of going to England. She did and ended up making shorts with him for the rest of her life, as one half of a female Laurel and Hardy-type duo. John: She always wanted to be taken seriously as a dramatic actress and she made quite a few dramatic films, but it was comedy where she made her mark. I get the impression that left her professionally unsatisfied. Is that correct? Michelle: I think it was the comedy shorts that left her unsatisfied. She made a brilliant comedy in England called ‘You Made Me Love You’ which was extremely funny and entertaining. But it had substance too, and lots of location shots, dramatic sequences and emotion. She loved making the film and told a reporter that it was the only time she’d been truly happy on set. So I think she did enjoy comedy, but the shorts were stifling for her. I personally love them, but I can see where she found a problem. Instead of being able to get her teeth into a great part, she only had a tiny story which was filmed in a very short space of time. It wasn’t fulfilling for her, and I can totally understand why. It would be like me forever writing articles instead of books. It would be very frustrating. John: She worked with so many of cinema’s great male comedian’s: Laurel & Hardy, The Marx Brothers, Charley Chase, Buster Keaton, Wheeler and Woolsey. Did she ever mention a favorite? Michelle: I know that she got on very well with Laurel & Hardy, though of course she only worked with them briefly. She worked more with Charley Chase and he was extremely depressed and upset when she passed away. The chemistry they had in their films is evident when watched back today. Although I don’t believe Thelma had any favorites, she and Charley seem to have had a great time together. John: Of course she also worked with two excellent female comediennes, Roach teaming her up with Zasu Pitts and later with Patsy Kelly. I believe in both cases, she was good friends off-screen with both ladies? Michelle: Yes she was. She saw ZaSu just days before she died (which resulted in ZaSu being called to testify during the investigation), and she was very close to her son, too. He told me that he’d call her Aunty Thelma, and the two would often play on the beach outside the Sidewalk Café building. When I spoke to him I could tell that he had a great deal of love for Thelma, which was obviously passed down from his mother. Patsy too was good friends with Thelma, and became extremely depressed after she died. Thelma helped her very much when Patsy arrived in California, and refused to let her get on the train when she wanted to give up and go home. She helped with Patsy’s finances and even sent the tax man away with a flea in his ear, when he came snooping around to see Patsy’s receipts. She really looked out for her as a sister as well as a friend. Thelma was a good person and a very loyal friend to Patsy, ZaSu and many others too. John: Thelma was considered the straight person in both these teams, but I watched a few of her shorts recently and in ‘Show Business,’ and especially in ‘Alum and Eve,’ Thelma definitely holds her own with the physical aspects in these shorts. Michelle: I absolutely agree. She was hilarious too in ‘Asleep in the Feet’ and ‘The Bargain of the Century.’ She was definitely not afraid to throw herself around and fall over, and those eyes of hers! With just one look, she could totally change the whole scene. I know she was getting miserable acting in shorts, but I just love them. I often watch them late at night when I’m in need of a laugh. I keep sending links to my dad too, and he has watched (and enjoyed) many of them. John: Can you tell us a little about Roland West since his relationship with Thelma directly or indirectly seems to have led toward her death? Michelle: Roland West was a director, though by the time Thelma passed, he had all but retired. Thelma worked with him on ‘Corsair’ and although he was married, the two ended up having an affair. From the very beginning, West was more than a little controlling. This was confirmed when he decided to change Thelma’s name to Alison Loyd, “to take the taint of comedy away” as he told reporters. He gave several interviews on the subject, where he said the name change was a way of erasing Thelma’s past and at one point even declared Thelma Todd to be dead and refused any mention of her name on set. Everyone had to call her Alison and there were no exceptions. Why Thelma allowed this is unclear and it is all rather disturbing, but Hal Roach refused to call her Alison, so when she went back to the studio (after the relationship with West had ended) she reverted back to Thelma. Several years later, West had the idea of starting a café business. He approached Thelma to see if she would like to be the name above the door, and she said yes. By this time she was rather frustrated by the movie business and it was her way of taking a break from it. It would seem that the relationship was reignited during this time and the two had apartments over the café with only a wooden, sliding door between them. After Thelma’s death, West carried on at the café, before his own death in 1952. John: She did seem to make some bad choices in men, Roland West, her husband Pat De Cicco. Was De Cicco connected to the underworld? Michelle: De Cicco described himself as everything from an acting agent, to a polo player, businessman and everything in-between. One person told me he was something of a wannabe gangster, who was known to hang around with mobsters at times. He of course never publicly said anything about this interest, but certainly he lived an eventful life with various headlines for arguments and fights. We’ll never know why Thelma fell for him, but it wasn’t long before their relationship turned sour and she filed for divorce. John: An early book on Thelma, Hot Toddy: The True Story of Hollywood’s Most Sensational Murder, by Andy Edmonds, paints a much darker picture of her life; an abusive father and controlling mother, Thelma as an alcoholic and addicted to diet pills. Finally, the author claims with almost certainty, though there is no way to prove much of what is said, that Lucky Luciano was responsible Thelma’s murder. It’s filled with half-truths and lots of innuendo that have been taken as gospel by many. Any thoughts on it? Michelle: I don’t really have any thoughts on this book at all to be honest. It has been a very long time since I read it. John: What I liked about your take on how Thelma died is you present three possibilities, but do not come to a definitive conclusion. You make no claims on solving the mystery. Your thoughts are based on evidence and not hearsay. You treat Thelma with respect and do not sensationalize her life making it sound tawdrier than it actually was. Michelle: Thank you very, very much for saying that. It was my aim when writing the book, to present Thelma as a human being, rather than ‘the body in the garage.’ How awful to only be remembered for the way you died. How tragic and sad, when you have achieved so much in your life, and yet that happens a lot. I have written extensively about Marilyn Monroe, and even now the most common question is ‘How did she die?’ If I knew the answer to that, I’d be a millionaire! I do not know how Marilyn died; nobody knows how she died and no matter how many people say that they have uncovered ‘the truth’, we will never know for sure. The same goes for Thelma too. I could only present the evidence as I found it, and that involved me going right back to the newspapers from 1935, before time managed to cloud the waters and create even more theories than there already were. I didn’t want to say ‘this is definitely how she died’ because I would just be adding more smoke to an already roaring fire, and besides, it would only be my opinion anyway. Instead I wanted to present theories and provoke thought and discussion. John: Had she lived, any thoughts on where her career would have went? Michelle: I think she would have moved to England. She absolutely adored the UK and the film she made here. She loved being able to walk round the streets, visit the museums and take in the art galleries. She told a reporter shortly before her death that she wanted so much to come back and work in the UK. In fact on the very last night of her life, she talked to actor Stanley Lupino about going back to the UK and working with him again. I certainly think Britain would have been part of her career, but alas we’ll never know. John: One final question. What do you hope people come away with after reading your book? Michelle: More than anything I wanted to treat Thelma with respect, and bring her name back to the limelight. Laurel & Hardy are still as big today as they were in the 1930s, and I want this so much for Thelma. If my book can get people talking about her amazing talent once again, then I will be extremely happy. If they come away knowing that she was a real-life human being with a brilliant mind and talent, then I will have done my job. John: Michelle, I want to thank you once again for the interview. I hope you book encourages people to seek out Thelma’s films and see for themselves the wonderful actress she was. Michelle: Thank you so much!! I really hope the book does that too. It would be a dream-come-true to have Thelma’s life and career rediscovered by a new audience. It really would make me extremely happy for Thelma and for us all. This entry was posted in Interview and tagged Interview, Michelle Morgan, Thelma Todd. Wonderful interview, John, very thorough and – as is Michelle’s bio – very respectful of Thelma’s life and accomplishments. Which is deserved but has been sorely lacking in many earlier articles and books (i.e., Hollywood Babylon) about her. Oh wow! I forgot about Hollywood Babylon. I read that book way back when (late 60’s? early 70’s?). Completely don’t remember Thelma being in it, but it’s been so long. Thanks! A fantastic, utterly fascinating read John, and another interview run by you for the Hal of Fame! Yes Todd’s death is one of the great unsolved mysteries. Tragedy struck that family more than once of course. You are a natural for the history of Hollywood, and this was a real joy to read. Michelle’s answers were terrific! Thanks Sam! The book is fascinating and is well worth reading for both fans of old Hollywood and mystery fans.